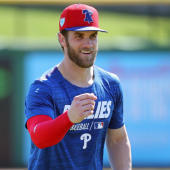 Franco is in an open competition with Scott Kingery to be the Phillies' starting third baseman, Scott Lauber of The Philadelphia Inquirer reports. Franco probably saved his Phillies career with a hot stretch in the middle of last season, but his final line (.270/.314/.467 with 22 homers in 131 games) wasn't anything special. Kingery did very little with his bat as a rookie but is theoretically a better defender, though he started just eight times at third base last season. The battle will be rendered moot if the Phillies manage to land Manny Machado, who they've reportedly targeted, though there have been no recent suggestions that a deal is imminent.